Why Are Catholics Great Writers and Baptists Are Not? For a while now I’ve been toying with a question. Maybe a year or so at the most. I’ve had an answer in mind but I still keep asking the question anyway. Why is it that Catholics are the best writers? And some of my favorites? 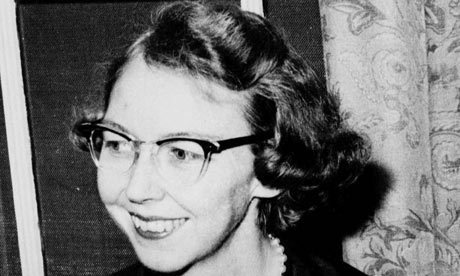 Flannery O’Connor. J.R.R. Tolkein. Thomas Merton. Dorothy Sayers. G.K. Chesterton. And what about those who are far more similar to them than the people I’ve surrounded myself with? You know like the Anglicans. Shakepseare. C.S. Lewis. Jane Austen. And one of my favorites these days is Eugene Peterson, who has learned a great deal from those of Rome. Heck, I would have never picked up Merton if not for him. My first and simplest answer is that they have a sacramental (read: sacred) view of words. Words are precious and full of beauty. They stand by themselves full of value, devoid of their use. But this is not how we evangelicals primarily think of words. We only use them – whoring them out. They have a function. Like machines. Maybe this is why I can think no writer, who is Baptist – outside of Bunyan – who is lauded as a ‘great writer’ by those outside of the evangelical subculture. What do you think? Can you think of great writers who are Baptists? Who am I missing? What have you read that could help me think about this some more? Is it relevant that all of them are Paedobaptists?